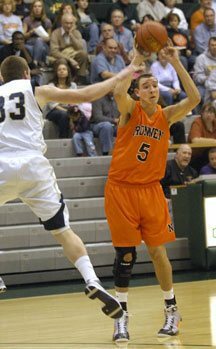 Normal Community High School standout basketball player Kyle Dierkes returned to the court November 24, 2009, making a full comeback from a serious knee injury. Kyle, who missed all of last season with the injury, scored 12 points in limited action due to foul trouble. A mere nine months after undergoing a meniscus and osteochondral allograft procedure on his injured right knee, Kyle has been practicing without any visible limitation or favoring of his right leg. He is still working his way back into basketball shape, but has been involved with all contact and post drills in addition to scrimmages. He is once again drawing attention from college scouts. �It�s great to be playing on two legs instead of one,� said Kyle.